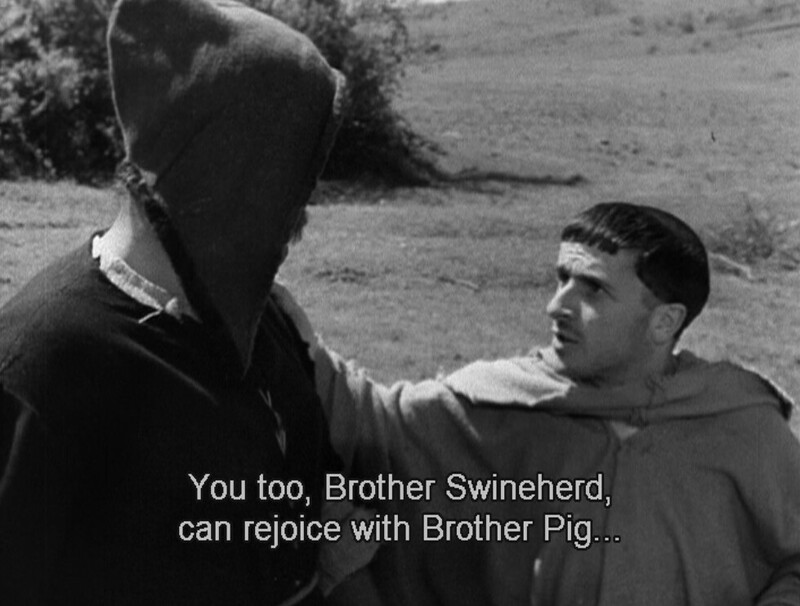 I expect you're familiar with the story of Brother Juniper and the Pig (Latin is here, paragraphs 2-9, Italian here, and modern English translation here). Briefly: Juniper is the fool of fools among Saint Francis's band, no doubt narratively necessary because the original fool, Francis, had become an the administrator of his flock. The first act of Juniper's holy foolishness: to satisfy a sick brother's craving for a pig's foot. Juniper heads out to the forest, finds a herd of pigs, captures one and cuts off its foot, and voila! He heals his brother. But then an enraged and nearly implacable swineherd shows up. Finally calmed by Juniper's innocence, the swineherd bestows on the friars the remainder the now 3-footed pig. Francis declares, "Fratres mei, fratres mei; utinam ego haberem de talibus iuniperis unam silvam" [My Brothers, my brothers: would that I had a forest of such Junipers!"] The end. 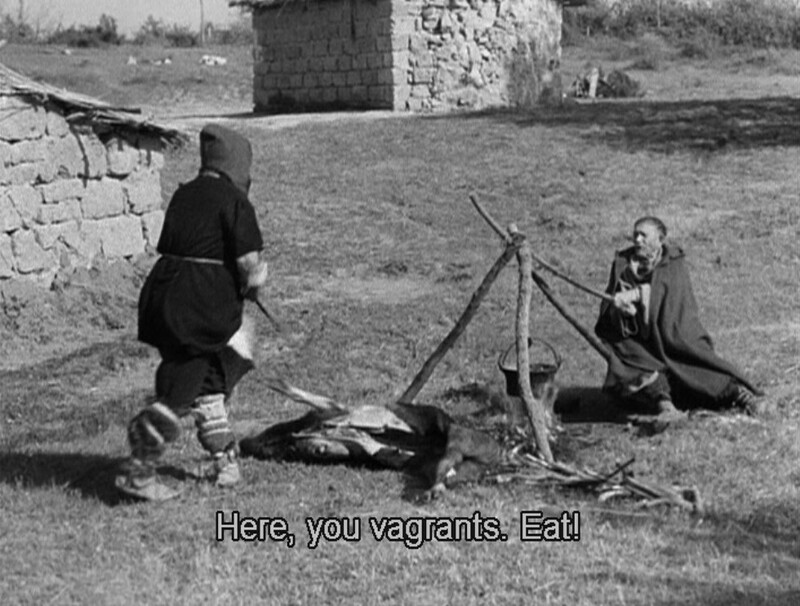 Roberto Rossellini's Francesco, giullare di Dio [Francis, God's Jester, distributed in English as "The Flowers of St. Francis"] treats the episode a bit differently. Click on the image above for a sense of how the hunt begins. Juniper isn't just hunting down a pig. 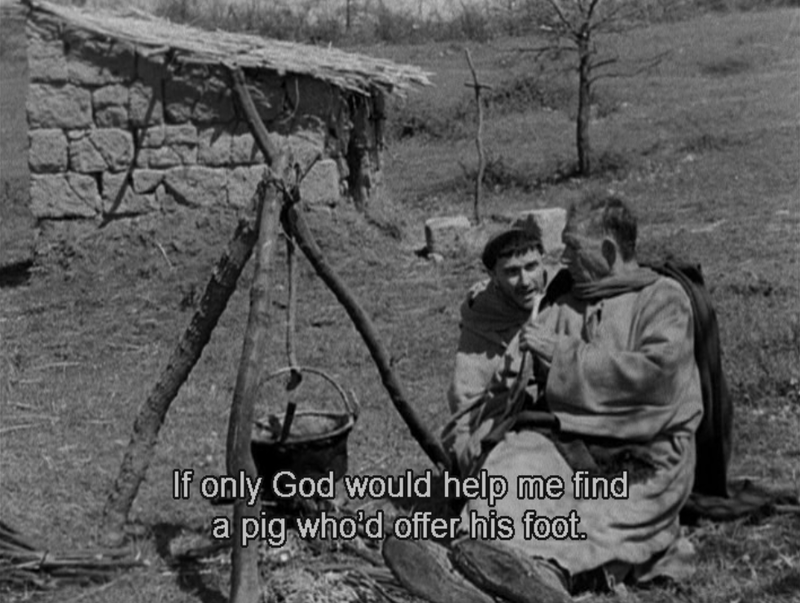 He piously understands the pig as participating in the community of charity: just as the film's Juniper keeps giving his habit away to the poor, so too will the pig give away its foot. Soon enough Juniper finds a herd of 5 or so pigs, and addresses them: "Brother pigs, the Lord has placed you on my path to help me. Listen to me. Brother pig, listen to me, please. Most handsome pig, with your succulent foot, would you grant my sick brother's wish? I promise I won't hurt you. The Lord will help us in need. Think, brother, of the few opportunities we have to do good." With this, Juniper and his knife disappear behind a bush, which shivers while an unseen pig screams. And keeps screaming. Horribly. Juniper prays, "Thank you, Lord, for the good that that pig and I will do with this foot." He returns, the pig's scream following him through the valley, and he declares, "Listen, he's thanking the Lord too." The pig screams for a while more, then stops. The swineherd, as in the original, appears, but remains implacable: "You call this doing good? 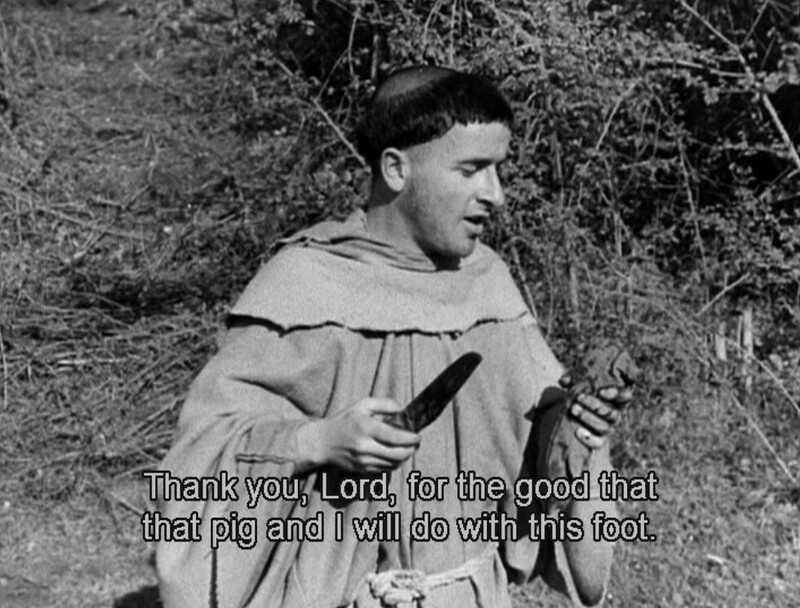 One of your friars cut off my pig's foot!" He leaves, and then here, too, returns with the carcass, but Rossellini (or Fellini (! ), or perhaps his other screenwriters) simply has the swineherd throw down a gutted carcass, shouting, "Here, you vagrants, eat!," and then stomp away. What he offers them may be less a charitable donation than an all-too vividly rendered carcass, made inedible by its own coagulated blood. So much for Brother Pig. He who cannot accept our peace, our charity, let him steal weeping, footless and pigless, away from our circle. Let his screams be heard as joining our prayer. To his credit, Rossellini has not made what the "The Decent Film Guide" calls a "beautifully simple little film," nor has he made a film that offers "a compelling vision of life that rejects materialism and violence." He has done that, that is true, but that's not all. Only a third of the way through Francesco giullare di Dio, Rossellini shows us the true, shattering violence of revolution, that the inclusiveness of community and of dreams of peace cannot help but leave behind the equivalent of a bereft swineherd and mutilated pig, each dragooned into someone else's simple and naive dreams of a pure charity. A succinct, canny, and devastating reading, Karl.